In Christchurch, New Zealand yesterday (15 July 2012), the warmest winter day ever in recorded history saw the maximum temperature reach +23C/73F : it was absolutely glorious. 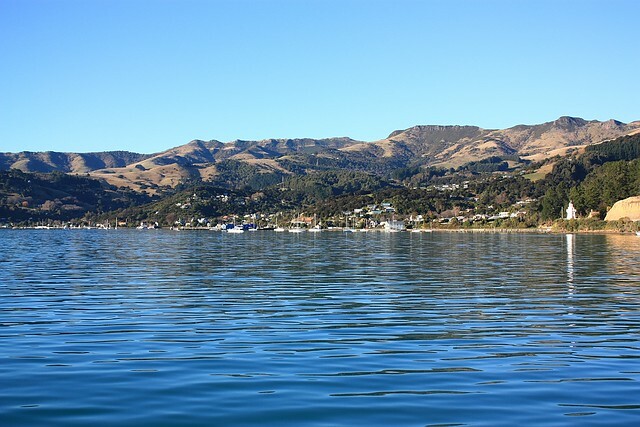 Because of this, I went out the following day to Akaroa (Maori for “long harbour”), also known as the Banks Peninsula. I purchased a two-hour ride on a boat out into the harbour and into the Pacific. The clouds cleared; the skies were wide, clear, and blue; and the seas were relatively calm. And there were Hector’s Dolphins to be seen, a pod of at least six. And oh yes, I crushed the 40,000th exposure on my camera. And if winter’s like this, I have nothing about which to complain, and for which I have every reason to be grateful. This post first appeared as a status update on my Facebook Page, and now appears here on Fotoeins Fotopress (fotoeins.com). I love Akaroa! It’s such a beautiful place to go for a cruise, or even just to walk along the harbour. I could definitely live there and be happy. What boat did you go out on? I loved going sailing on the Fox II but it was still really nice going out on the Black Cat boat as well. Great that you got to see the Hector’s dolphins! I saw them but didn’t get to swim with them the last time I was there because there were babies with them (and the NZ government doesn’t let you swim with them below a certain age because they are so endangered). Then again, my body was probably happy I didn’t get in the water because it would have been freezing! Hi, Kristin. I took the Black Cat boat out for a harbour tour at 130pm local time. With three crew on board, there were only six other passengers; so, it was easy to move out and about, and it was easy to ask questions. The entire tour was very casual, and the two hours passed by quickly. I can only imagine what it might be like with a full boat, with passengers stuck like sardines. I was happy to have seen a pod of Hector’s Dolphins, a couple of penguins, some seals (getting some sun), and many cormorants. I admit it – I’m a wimp, and there was no way I was getting into that winter ocean water for a swim. 😉 Thanks for reading and for your comment! Yeah, it can often be a very good thing to go off-season, since you get a much more personalised experience! There were only around 6 of us on my boat as well so I got a chance to chat one-on-one with our guide and driver, which was really nice.